There is a special excitement visiting a place for the first time. The anticipation of what you might see and the joy of creating a new image is certainly exhilarating, but having the opportunity to return over and over to a favourite destination can be just as memorable. In the center of Saint John near the industrial and shopping district is this jewel known as Silver Falls. Hidden in a valley is a twisting waterway that has several small falls but the main attraction is a wider horsetail falls at the upper end and a tiered cascading falls at the bottom. The falls are beautiful in any season but a bit more challenging in winter due to the steepness of the hills down to water. Each season creates a unique view. Changes throughout the year precipitation and temperature mean that you may see anything from a gushing veil to a cascading trickle. Each visit allows me to bring home images, from different perspectives and new angles. Changes in the water flow, the color of the surrounding greenery and wet or dry rocks makes each time unique. Once in a lifetime trips are something that every photographer hopes for but don’t overlook what’s in your own backyard and one visit is never enough. Been there done that, doesn’t apply to photography. This is perhaps the most peaceful and beautiful place on Earth for me. About 45 minutes away from my home is this amazing beach with this sandstone island called “Split Rock”. The time to visit is at low tide so you can experience walking on the ocean floor. Not just the beach and shoreline, but the true ocean floor allowing you to also get up close to the awesome rock. Twice a day for a few hours this opportunity presents itself. If I lived close enough I would be there each time it happens. It’s magical, peaceful and absolutely beautiful. The photography is endless and subjects abound everywhere; on the ground, in the rocks, in the trees and sky. Lately, what strikes me is that even though this place is a bit out-of-the-way for the public and not known to a lot of people they are regulars who visit often. Yet it remains pristine. The area has little to no trash to speak of. It shows that if people really care and want to have a beautiful place we are capable of keeping it that way. To those who visit, thank you for being good stewards. Now let’s do it everywhere. We’ve proven it’s possible. A year is a strange thing. It’s said the older you are, the quicker the years go. I’ve learned that it is very true – 2016 flew by. I didn’t intend to skip eight months between post, it just happened. So what have I been up to? There has still been lots of photos and I’ve been happy with quite a few – some more than others. The most memorable things about 2116 weren’t necessarily the images but the people I’ve crossed paths with. The Photographs from last year are a credit to some of those individuals, along with the knowledge and places they shared with me. I have been fortunate to spend some time with a biologist, fellow artists, business people and old friends who I have become reacquainted with. Many of them have taught or showed me something new and helped me grow as a photographer. This is my first of 2017 and I’ll attempt to keep you updated on a more regular basis this year on what I’ve been doing, what I’ve seen and who I meet along the way….. Stay tuned my friends. When I first started my journey into photography it was about creating and documenting nature and the other things I saw while exploring. I was inspired by light, nature and the people I was with. As I’ve gotten older it’s become 50% about the final image and 50% recharging mentally or getting away from the daily pressures of life. A few years after I bought my first camera I began to have severe anxiety and panic attacks. Photography became a distraction and a way to focus on something other than my anxiety. Over the years photography has remained part of my therapy and method to maintain a sense of peace. “Peace like a river”… – When I younger we would sing a hymn in church with this line in it but it was just words in the song. It really didn’t have any relevance to me until I got older and realized what the author of the song was talking about. Horatio Spafford wrote the hymn after a personal tragedy and even though I have not experienced an event close to what he endured, I have learned to appreciate the reference in the hymn. I’m very fortunate that I live in an area of Canada where I’m surrounded by water. I’ve come to realize the truth in the statement “Peace like a river”. There is something very calming listening to a waterfall or waves while looking at an immense body of water. It can be visually intense but audibly relaxing at the same time. Perhaps that is why we have taken to artificially playing the sound of water in our homes to sooth us. Sometimes while sitting by the ocean or a river I leave my camera by my side or case, just spending the time to reflect on the grandness of the scene and appreciate the magnificence of God’s design. There is a part of me that finds peace while being a spectator of something so incredible. Even though I don’t totally understanding how it is all held together but recognizing it is God who is ultimately in control. The waves will crash and water rises but He is the one who determines just how high that is. I’ve heard it said that the older you get the quicker time goes. Now the older I get, the more I think it’s true. It was about seven months ago the last time I wrote but it doesn’t feel like it was that long. I had good intentions but a bit of writers block along with other commitments seemed to prevent me from sitting down and sharing my thoughts and images. So here I am at the end of December with some of my favorite photographs and memories from the year that came and went so quickly. The winter of 2015 was record-breaking in terms of snow. The driving and shoveling were awful but the photography was spectacular and the best I’ve experienced in recent years other than perhaps the ice storm of 2014. Once the snow finally melted and spring arrived I began exploring the province and found some beautiful gardens, waterfalls and fun wildlife. If it wasn’t for my wife’s keen eye I wouldn’t have captured the painted turtles or had the opportunity to show my kids a beaver if I hadn’t taken a friend from India on a trip to a local park. How many turtles you see? The summer was likely the highlight of the year as I was able to take a whale watching tour off Brier Island, Nova Scotia where the Bay of Fundy meets the Gulf of Maine. Unfortunately the weather didn’t cooperate as much as I’d hoped for, but seeing humpback whales within 50 feet of our boat was an absolutely amazing experience and brought a new appreciation for God’s creation. “Waiting to Exhale” – Humpback, Bay of Fundy, N.S. Autumn was all about the color this year. In the sky, trees, on the water as the sun was setting and with the added bonus of the blood moon. Of course those who know me it is also always about spending time by the amazing Bay of Fundy. Ansel Adams once said “Sometimes I do get to places just when God’s ready to have somebody click the shutter.” – For me it definitely applies~ Most often I feel that God is the real artist not me, I just happen to be there to record it. It’s a privilege. So what did I learn? I can drive 5 minutes or 5 hours and always find something that is remarkable and I just need to slow down to see it. When I’m exploring I’m trying to find the extraordinary and create images that people haven’t seen before, but I truly believe it is also about finding the common uncommon again and looking at the things we see every day in a new way and appreciating them. Here’s to 2016. I hope you are able to take some time this year to get out and experience some of God’s handiwork and appreciate it for yourself. I have always been amazed by musicians and painters who create each new piece from a blank page or canvas. They begin with nothing more than what they visualize in their mind and can labour for weeks or months to perfect a piece. As much as I may plan and attempt to create the photograph I imagined, sometimes is just doesn’t happen. All of the angles, light and composition won’t come together no matter what I try. Then there are those moments when the effort is not even there and the subject presents itself saying “Take my picture”- The time and place are perfect. 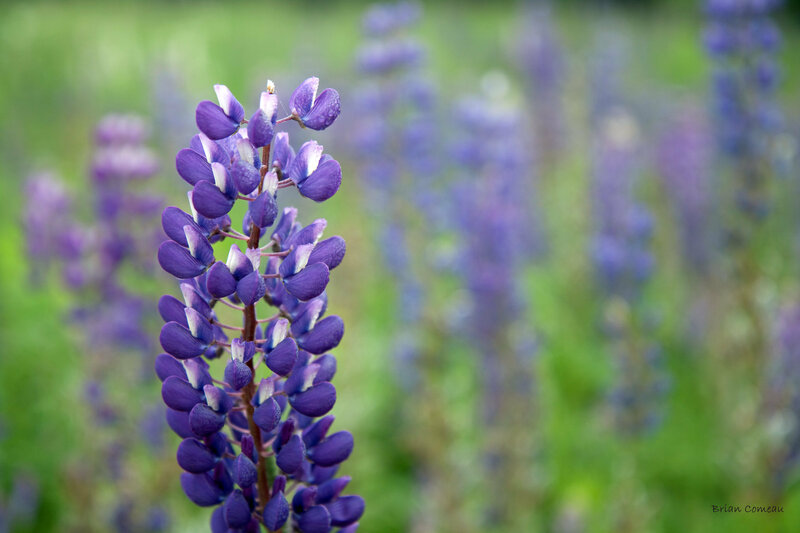 Last summer I was driving through a local industrial park and I spotted a small field of lupines between two large buildings. The patch was likely less than a 100 meters long but perfectly placed between the two driveways. I didn’t have my camera at first sight but I made a mental note of the place and went back a few days later with my wife and youngest daughter. We spent less than 30 minutes there but the conditions were absolutely ideal. Overcast skies, a bit of a mist and slight breeze. My daughter became so excited about the flowers that she borrowed my phone to take some of her own photographs. It’s funny how photography works sometimes. There can be days of planning and preparation, shooting image after image and I come home feeling empty-handed. Then there are those days that God does all the hard work and I get there just at the right time. 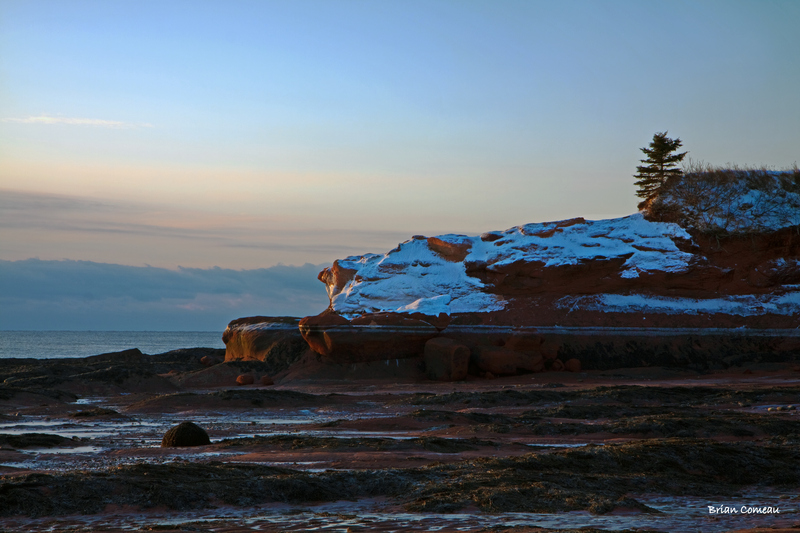 For anyone who has followed my photography and blog for a while you’ll know I love the beach, and in particular the Bay of Fundy. My family and I have spent many days during the summer at different beaches all around southern New Brunswick and parts of Nova Scotia. I especially enjoy visiting beaches at sunrise and sunset. The anticipation of the light, reflections, clouds and the potential image is an exciting moment for me that never seems to get old. In recent years I’ve tried to make a more conscious effort to visit some of the local coastline in the winter to take advantage of the different light and perspective with the snow and ice. Last month I visited one of my favorite beaches in the morning and was fortunate that the tide was heading out. For years I have generally been drawn to one side of this beach more than the other. This time I was intentional in my decision to visit the other side of the beach and inspect it closer than I have before. As I walked the shoreline and photographed I was inspired by what I saw through the lens. At the same time I was a bit disappointed, thinking about subjects I have potentially missed because I neglected to visit the other side of the beach so many times. I strolled along this part of the beach for about an hour. When I came home and edited my images I was really very happy to see that I was able to capture some new amazing images of God’s creation like the one below. Sometimes avoiding the easy or obvious subject can pay off. Photography is usually considered a visual art, and typically my inspiration comes from the scenery that is all around. My favorite subjects are the coastlines, beaches, lakes, rivers and wildlife that are near my home. I love to explore the back roads and rural areas outside the city while looking for interesting new subjects. 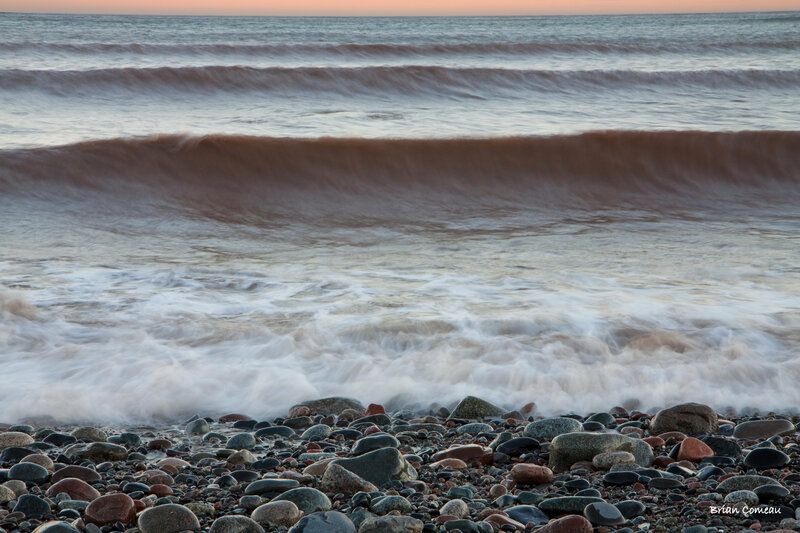 “Dusk Waves” – Bay of Fundy, Saint John. A few months ago I was on a walk with my wife and daughter. We could hear the sound of the waves crashing on the beach and we decided to take a closer look. The setting sun and the sound of the bay created the perfect inspiration. It was a few days later while editing that I realized if I hadn’t heard the waves that day I likely would not have gone to the beach and would have missed this moment. Not only did I come home with an unexpected image, I also learned that it is just as important to listen as it is to look when seeking new images. 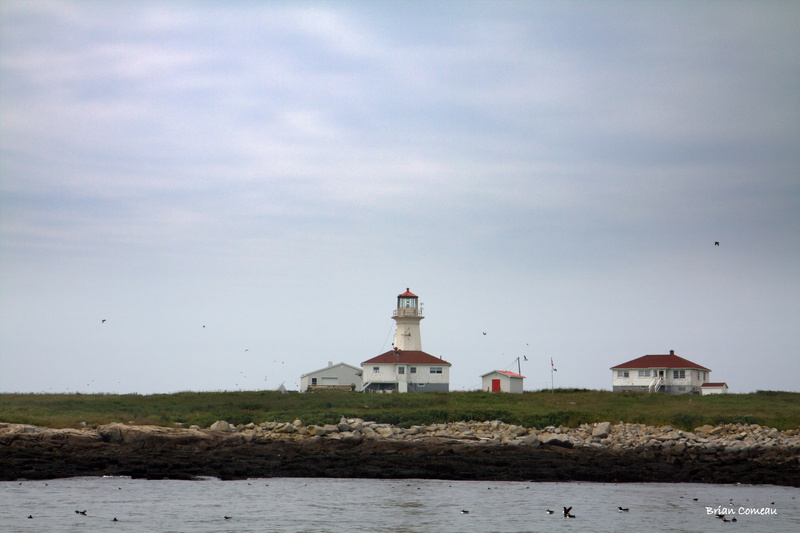 Machias Seal Island has been on a list of destinations I have wanted to visit for several years. I was fortunate enough to take a trip there this month, and it certainly didn’t disappoint. You wouldn’t think there would be much to see with an area less than twenty acres, but like they say, big things can come in small packages. If you are nature photographer or birder this amazing bird sanctuary is a must see. 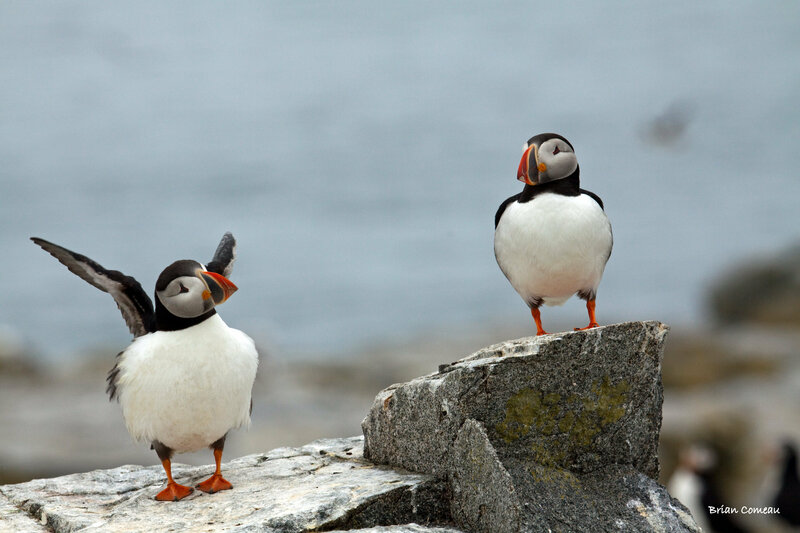 It is home to a variety of seabirds such as Razorbills, Common Murres, Arctic Terns, Eiders and the stars of the show – Atlantic Puffins. Seal island is located approximately 16 km (10 miles) southeast of Cutler Maine and approximately 19 km (12 miles) southwest Grand Manan in the Bay of Fundy. Between late May and mid-August there are two companies that run boat tours to the island, one from Grand Manan and one out of Cutler Maine. My wife and I took the tour from Maine due to a conflict with the departure time for the ferry to Grand Manan. Either location requires an overnight stay the day before because the tours leave between 6:30 and 8:00am local time. For those who have been whale watching or on other sightseeing tours there is always the fear of not seeing anything. That is not the case here unless it’s because of fog. Our boat launched about 7:30 am, and we were fortunate all aspects of the weather cooperated. The bay was smooth and the fog lifted before reaching the end of our 45 minute cruise. The anticipation was high as we all caught a glimpse of the manned lighthouse and saw puffins in flight over the water towards their sanctuary. Once in sight of the island it didn’t take long for the action to begin with seals sunbathing and bouncing on the rocks as well as the seabirds coming and going like bees from a hive. We taxied ashore and gathered by the lighthouse keepers and awaiting our instructions. We were split up into groups of four or five and taken to a blind to spend the next hour and a half. Normally I might be a little claustrophobic but that 90 minutes felt more like ten. The birds posed and played for the cameras like they were on stage. One other photographer said it was almost like it was cheating being so close to the action. You quickly see where their nickname comes from as their personality truly shines – clowns for sure. 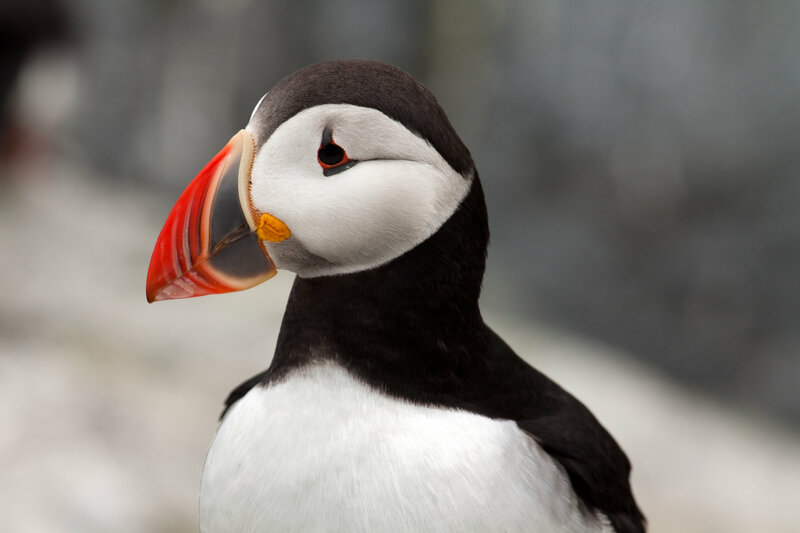 Puffins are not an endangered species but their numbers are monitored closely now around the Gulf of Maine and Bay of Fundy due to their popularity with hunters until the late 1800’s for their meat, eggs and feathers. With their smaller numbers in past years it left them exposed to other seabirds like gulls taking over their habitat. The decline of herring as a food source in recent years is also a concern, as is a reduced rate of reproduction. 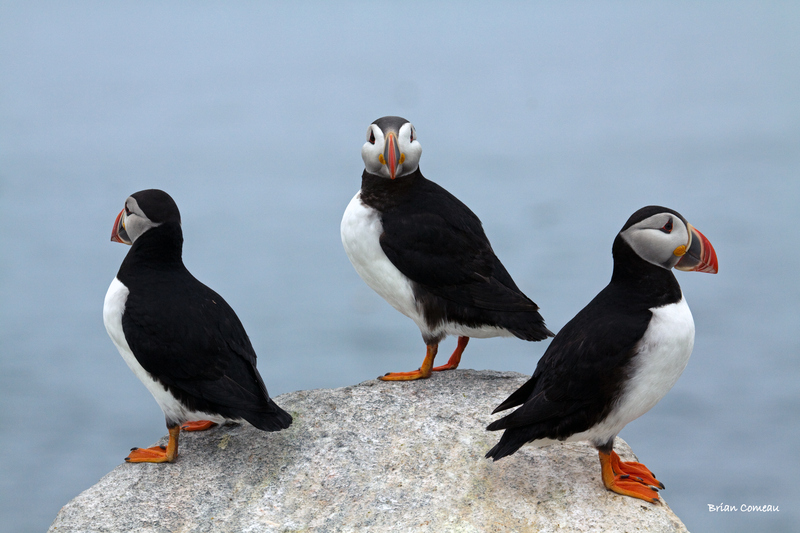 Puffins only lay one egg each year and don’t mate until about age five. 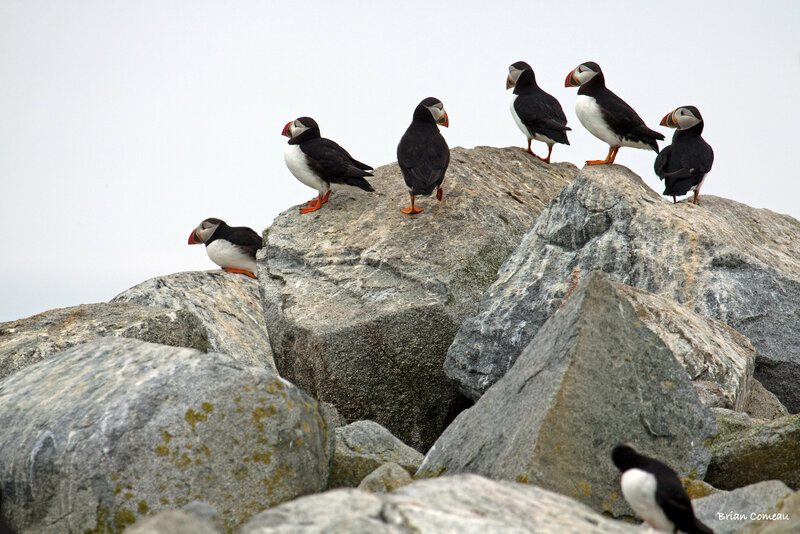 Organizations like the Canadian Wildlife Service, University of New Brunswick and the Audubon Society are all studying and working to protect Puffins and the other native seabirds. I’ve never been on a safari but I assume you would experience a similar affection for the animals you photograph there. Once you see firsthand how fragile an animal and their habitat are, it really changes the way you look at that particular creature and the actions we can have; both positive and negative.